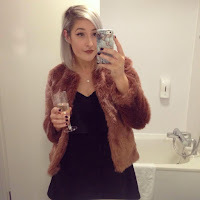 Floral Danielle: Sunday summary #10 - Halloween, Oh My Love SS15, purple hair and meeting Will Smith! Sunday summary #10 - Halloween, Oh My Love SS15, purple hair and meeting Will Smith! I've had a very busy few weeks since my previous Sunday summary post so here's a little instagram catch up post. I love writing these posts as they're a bit more personal than reviews and wishlists (not that I don't love writing those all the same too!) but I feel like these will be the ones I come and look back on to see how much has changed throughout the years! I love their new stickers too, love a bit of sass! I actually think Halloween might be my favourite time of the year. At university we made sure we went all out with our parties and costumes. Me and my best friend Courtney carved some pumpkins this year, and I went to a party with my sister and some friends. I left the costume deciding a bit late so went as a skeleton nurse... hopefully I'll have a better outfit next year haha! How cute is this little house front? I love taking photos of pretty houses as inspiration for when I someday have a house of my own! I'll definitely be having lots of flowers around the front door! This is my lovely new Fifi Lapin iPhone case and I'm obsessed with it, it's so cute! Check out who I met! Okay so the title might've been a bit of a lie, but this cardboard cut-out of Will Smith looked so real in the photos! What do you guys think of this purple hair? This photograph is actually photoshopped but I'm really tempted! This week I eventually got my upgrade from an iPhone 4 to a 5c. I don't think I've ever been so excited! My cute little doggie knows she shouldn't be on the bed, but how could I say no to this fluff ball?! This Wednesday me and my boyfriend Joe had a lovely date night. We had Chiquitos for dinner including some yummy Strawberry Daiquiris and then we went to see Gone Girl at the cinema! Anyone else seen it? It was so different to what I thought it would be and I loved it! This weeks favourite song/music video is Ugly Boy by Die Antwoord. I've posted a Die Antwoord song previously on a Sunday Summary post but I needed to post this one. Not only are they my favourite band, but this video which was released this week has so many famous people in it I love including Marilyn Manson, Dita Von Teese and Jack Black! I probably will at some point, I've wanted to for ages! I know isn't she a cutie?! I like the purple hair :) you should be brave and go for it. I love your blog! Haha, I think you would look lovely with purple hair. I wish I had the guts to do that! !